Burj Khalifa is the worlds tallest building, Soaring high at 555 meters, At the Top, Burj Khalifa SKY is fittingly Dubai’s most iconic destination. Get ready to enjoy exclusive access to the redefined, highest outdoor observatory in the world, spread across levels 148 and 125 of Burj Khalifa. Your journey begins when you step into the At the Top, Burj Khalifa SKY lounge, from where you will be personally escorted to a dedicated elevator. Inside, watch in amazement as specially designed projections give you the feeling of flying over global landmarks as you ascend to Level 125. The entry to the structure is through Dubai Mall. Once you reach the entrance and make your way through the elevator, you will find lots of the information regarding the building. Once at the top, you will be able to enjoy an unobstructed 360-degree view of Dubai. The height of the tower from Level 124 to the spire more than the height of the Eiffel Tower. The spider lily or hymenocallis, which served as inspiration for the form of Burj Khalifa, is a noticeable part of the stunning landscaping that surrounds the tower. The plaque placed outside the entrance to Burj Khalifa's Corporate Suites is the one that His Highness Sheikh Mohammed Bin Rashid Al Maktoum unveiled marking the launch of the iconic tower. Burj Khalifa has a total of 57 elevators and eight escalators. Among them are the world's tallest service elevator, which has a capacity of 5.500 kg and the Observatory elevators, which are double deck cabs that travel at 10 m/s. 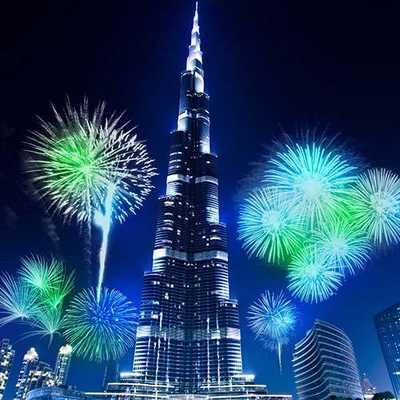 During peak cooling hours, Burj Khalifa requires about 10,000 tons of cooling, equivalent to the cooling capacity of approximately 10,000 tons of melting ice. The total weight of aluminum used in the building of Burj Khalifa is equivalent to that of five A380 aircraft and the total length of stainless steel bullnose fins is 293 times the height of the Eiffel Tower. Burj Khalifa's curtain wall is the equivalent of 17 soccer fields or 25 American football fields. Day Mode, Twilight mode, Night Mode. Rising to more than 800 meters, Burj Khalifa regularly harnesses the forces of nature to stage a lightning show, making it one of the most conspicuous lightning conductors in the world. Burj Khalifa is the first world's tallest tower to include residential space. The elevators that take visitors to the observation decks of Burj Khalifa at a speed of 10 m/s has a unique utility. It has a lower deck to transport corporate visitors and those visiting At.mosphere, the world's highest restaurant. Cancellation policy: 48hrs prior to the date of the ticket.